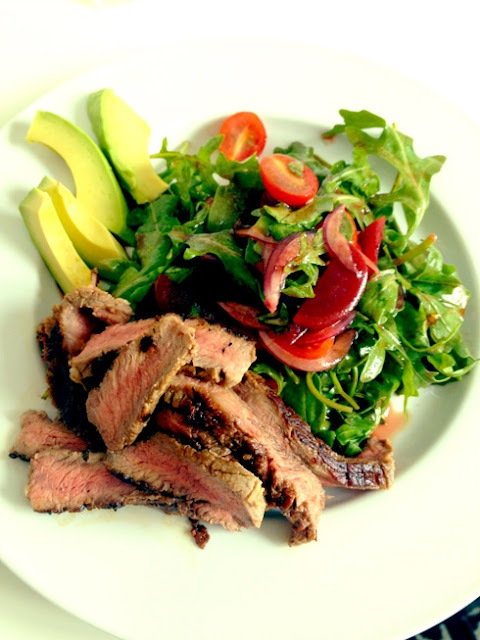 Steak salad is a delicious light meal when one person (umm, she) wants a salad and the other person (he) wants meat. Fry or grill up a nice steak - be sure to use a good piece of semi-fatty steak so it retains juice after setting. I always prefer ribeye, but sirloin works well too. I also prefer all red meats medium rare because it keeps most of the flavor and juiciness, but medium will also work well. Season it before frying - rub sea salt and a bit of pepper into the flesh before it hits the heat. Once it is cooked, let it sit and cool. This means you should cook it just slightly less than you normally would since it will continue to cook for a minute after you remove it from the heat. 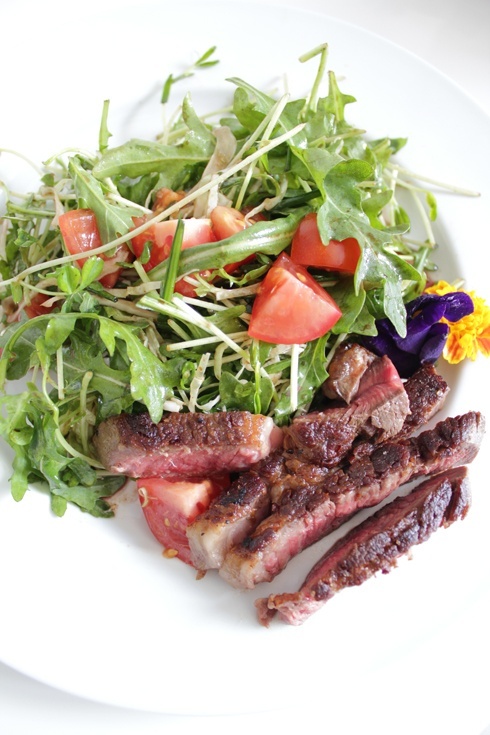 Mix a light salad - in most cases, steak pairs well with hand shredded green or red leaf lettuce or arugula. Add some extras - sliced beefsteak tomato, avocado, sprouts - whatever strikes you that day. Use a vinaigrette that has less oil than usual (so about a 3 part oil, 2 part vinegar) to help cut the fattiness of the meat, and pre-toss the salad with it before plating. Want to make a really nice garnish? Use edible flowers. There is something so elegant and unusual about having a couple of purple pansies or bright yellow marigolds on the plate. This is so me and my husband.